Enable Payables and Bills - If this option is selected, you will be able to access the Payables and Bills features in Control. If this option is not selected, you will not be able to access the Payables and Bills features. Enable Receiving Documents - If this option is selected, you will be able to access the Receiving Documents features in Control. If this option is not selected, you will not be able to access the Receiving Documents features. Enable Purchase Orders - If this option is selected, you will be able to access the Purchase Orders features in Control. If this option is not selected, you will not be able to access the Purchase Orders features. Reset Values: If this button is clicked, it will reset all your current selections to your default selections. Track changes to line item statuses as activities. If this option is selected, line item status changes will appear as activities. If this option is not selected, line item status changes will not be tracked. Show Vendor Information If this option is selected, vendor information will be shown in the purchase order. If this option is not selected, vendor information will not show. Expected Date is Required If this option is selected, the expected date will be required to save the purchase order. If this option is not selected, the expected date will not be required to save the purchase order. Default Purchase Order Description to the First Line Item's Description. If this option is selected, the text in the description field will be automatically filled in with the first line item's description. If this option is not selected, the text in the description field will not be automatically filled in. When cloned, add the following prefix to the description: [ text entry ] If this option is selected, the text entered in the text entry box will appear before the description in the purchase order if it is cloned. If this option is not selected, no text will appear before the description in the purchase order if you clone a purchase order. Require Expected Payment Method If this option is selected, a payment method will be required to save the purchase order. If this option is not selected, a payment method will not be required to save the purchase order. Disclaimer Text: [ text entry box ] Any text entered here will appear by default in the Purchase Order notes section. If no text is entered, nothing will appear by default in the Purchase Order notes section; you will be able to manually enter text in this section either way. When cloned, add the following prefix to the description: [ text entry ] - If this option is selected, the text entered in the text entry box will appear before the description in the bill if it is cloned. If this option is not selected, no text will appear before the description in the bill if you clone a bill. Default Rule for Adjusting Bill Item Cost: :This option allows you to choose how bill item costs will be adjusted. Set Next Purchase Order Number: This is where the purchase order number for the next purchase order will appear. You can also click the 'Set Next Purchase Order Number' button and set your own number for the next purchase order. Set Next Bill Number: This is where the bill number for the next bill will appear. You can also click the 'Set Next Bill Number' button and set your own number for the next bill. Set Next Receiving Doc Number: This is where the receiving document number for the next receiving document will appear. You can also click the 'Set Next Receiving Document Number' button and set your own number for the next Receiving Document. This option allows you to create templates for Purchase Order notes. 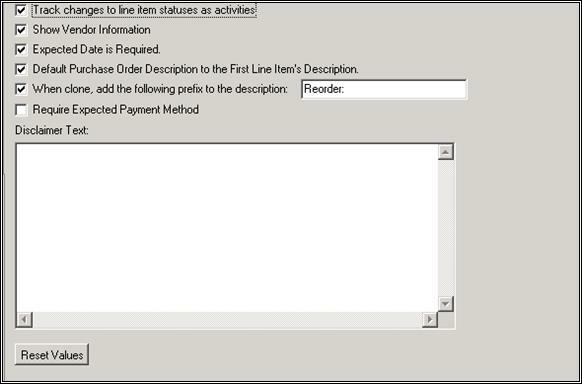 In this screenshot, the Purchase Order note template is named “Default PO Note”, which is shown in the first text entry field. Underneath the name of the template, you are able to create the template. This template reads “Hello World!”. - You also have the ability to insert merge fields into note templates, such as the contact's first name. Show Inactive. If this option is selected, all Estimate Greeting will appear in this list, whether they are active or inactive. If this option is not selected, only the active Estimate Greetings will be shown. This option allows you to create templates for Purchase Order notes. In this screenshot, the Purchase Order internal note template is named “Default Internal Note”, which is shown in the first text entry field. Underneath the name of the template, you are able to create the template. This template reads “Hello There! ”.